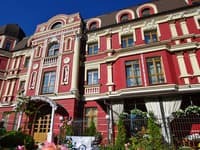 "Villa Ninna" is a small mini-hotel in Kiev, which is a few minutes walk from the metro station "Nyvky", near the hotel is the exhibition complex "KyivExpoPlaza". 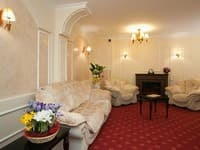 Guests can stay in the Standard and Suite rooms. Each room is equipped with necessary furniture, TV, bathroom with round-the-clock water supply. Free Wi-Fi is available. On site, there is a chargeable (round-the-clock) and free (from 20.00 to 8.00) parking, a sauna and a beauty salon. 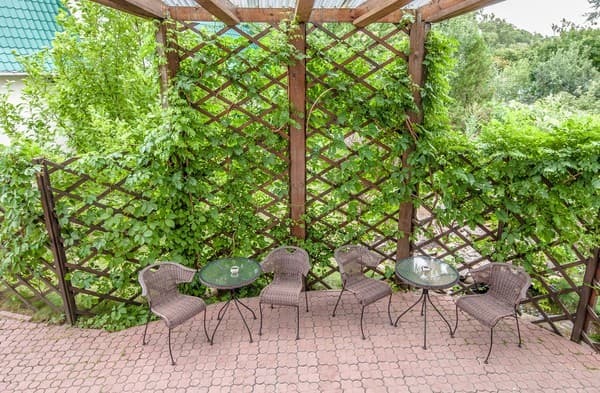 Near the "Villa Ninna" there are many cafes and restaurants. . Description of the room: Cozy room with 2 beds, 31.3 sq. M. A comfortable room for a business trip with a colleague. 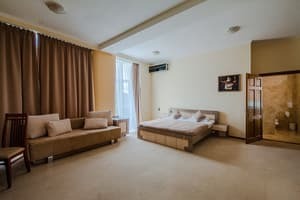 Large windows and a soft interior allow you to enjoy spending time in Kiev. The room has a 32-inch LED TV, accepts 25 programs in digital format DVB-T. In the bathroom there is a shower-cabin with hydromassage. For single use there is a discount. Description of the room: Bright and cozy room, with an area of ​​26.1 sq.m. with windows to the floor. Comfortable furniture will allow you to feel at home. The room has a dressing room, TV with a diagonal of 32 inches, accepts 25 programs in digital format DVB-T. The air conditioner provides heating and cooling of the room. In the bathroom there is a shower-cabin with hydromassage. For single use there is a discount. Description of the room: Junior suite with an area of ​​42 square meters, the maximum number of people living 2 + 2 people. Large room in the style of "Modern" with a terrace with a beautiful view of the park and the lake. The room is comfortable modern furniture - a large double bed with an orthopedic mattress and a sofa bed. In the bathroom there is a shower cabin with hydro massage. A wonderful solution for a romantic pastime. For single use there is a discount. Description of the room: Club suite with an area of ​​55.7 square meters with a terrace and bar for 4 people. It consists of 3 rooms: a bedroom with a king-size bed and a built-in closet, a living room with a convertible sofa made of genuine leather and a bar area and a wooden terrace. In the room there is also a 42-inch LED TV, accepts 25 programs in digital format DVB-T, air conditioning. For single use there is a discount. Description of the room: The marble suite is 60 sq. M., Capacity 2 + 2 people. A large, cozy, bright room with windows to the floor, a large bed and a large finished bathroom with a whirlpool bath and bidet. Samsung TV with a diagonal of 50 inches, reception of more than 200 TV channels in digital DVB-S quality, a large dressing room, modern furniture. For single use there is a discount. Декоративный камин придал особого комфорта. Большая гардеробная. Все услуги за деньги. Парковка - 50 грн, завтрак за отдельные деньги даже несмотря на то что он был включен в бронирование. В минибаре запустение, в номере нет даже воды минеральной. Два стакана, впрочем, присутствуют. У меня была проблема с интернетом на одном из устройств (ноутбуке), но искать пути решения никто и не собирался. Сложно найти даже заезд. Парковка оказалась платная (дополнительно 50 грн. 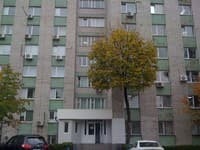 ), в номере кроме полотенца и туалетной бумаги никаких средств личной гигиены - ни шампуня, ни геля ничего, у мывайся и мойся водой. Минибар полупустой. Ни какой возможности поужинать. Замечательный отель и перснал! Все чисто и аккуратно! Молодцы! Нет никаких вывесок, что это гостиница. Есть собака во дворе, которую на ночь снимают с цепи, поэтому никуда ночью не выйдешь, если приспичет. It is possible to provide additional space. Refine at the time of booking. Guests can order breakfast at an additional cost. In walking distance there are grocery stores, cafes. 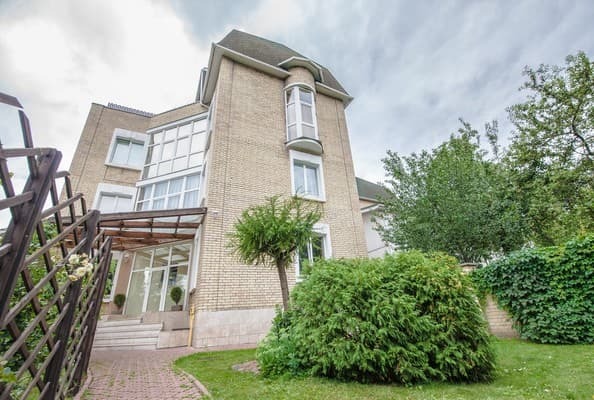 Villa Nina is located in a magnificent park area, while it is located at the intersection of major transport routes. Nearby is the metro, the nearest station is "Nivki". 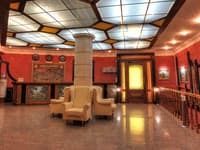 For the landmark, near the hotel is the exhibition complex "KyivExpoPlaza". The distance from the railway station is 7.4 km, from Borispol airport - 42 km.